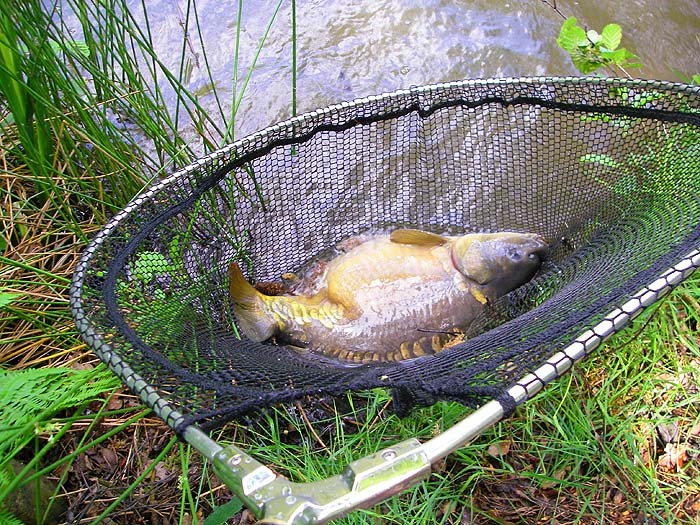 I don't go carp fishing all that often and I tend to be a bit conservative about my approach. To be honest I'd sort of forgotten just how close to the margin I can catch fish but it was brought home to me the other afternoon. Perhaps it's worth a word or two about why it might be worth fishing really close in. There are essentially four sources of food for fish in a lake (the same applies to rivers and seas of course). (1) Mid-water where the plankton lives and where there are also quite a number of free swimming insects and fish. (2)The lake bed where worms, snails, insects and the like tend to live securely buried or hidden among weeds. (3)The water surface film where emerging insects and flying creatures tend to get stuck in the surface tension. (4)The bank and overhanging vegetation from which animals like caterpillars and beetles are liable to fall in. If you think about it there's only one place where all these four food sources come together - the water margin! Not surprising then that fish in search of food often patrol the very edge of the pond or lake. The only down side for the fish, of course, is the fact that in the shallows near the edge it is vulnerable to predatory birds and the like and so, from the angler's point of view it is likely to be extra wary. However, fish in general and carp in particular are well aware of the abundance of food along the bankside. Even in bright sunlight, if they are not disturbed, carp will patrol the very edge of the water so it's a good place to plonk your bait. I'll give an example from my last trip. I'd decided , for a change, to take not only a few bread crusts but also some lumps of cheap luncheon meat. I could see a few carp on the surface and they seemed pretty active so I stayed well back from the bank, baited the hook with a lump of crust and lowered it so that it was on the water but touching the earth bank. I laid down the rod and took up the slack so that there was about a foot of line from tip ring to bread crust. Within ten minutes a fish slurped it up, hooked itself and tore out into the lake. magic! I took a picture, rolled the fish out of the net and moved twenty yards to another likely spot. Again I lowered the crust into the edge and sat down, well back from the water. Breaking a piece of luncheon meat into four or five finger nails sized bits I flicked them to the left of where my bait floated and just beyond the bank, where they sank to the bed in about a foot of water. Five minutes passed and I noticed the shape of a carp grovelling where I had put the meat. Interesting! After the fish moved off I flicked a larger piece of meat (perhaps an inch cube) into the same spot. This time it was perhaps ten minutes before I saw two biggish fish nosing around my free offering. After they'd left, presumably having eaten the meat, I reeled in and replaced the crust with a cube of meat. This was lowered into the spot where the two carp had been. Again it was probably ten minutes before a fish picked up my bait and moved off slowly. I'd left a foot or two of slack line on the bank and as it tightened I struck. Away went the carp at speed. I stood up to try and gain control but after a few seconds the hook puled and the fish came off. Perhaps I should have let the fish hook itself as I do with the breadcrust! I moved and had one more go but it was time to go for my tea, so I went.